In order to reduce cash handling cost of banks amongst other objectives, the Central Bank of Nigeria introduced the 'cashless policy'. The success of this policy hinges on the adoption of alternative payment systems one of which is mobile banking. Thus it is imperative for policy makers and other relevant stakeholders to anticipate and deal with inhibitions surrounding the adoption of mobile banking by bank customers in the country. This study investigates the determinants of mobile banking adoption in Nigeria using a modified version of Technology Acceptance Model (TAM). This incorporates Perceived Risk, Facilitating Conditions and Demographic Characteristics (Age, Gender, Educational Qualification and Income) to Perceived Usefulness and Perceived Ease-of-Use as determinants of Mobile Banking Adoption. We also propose that this relationship is mediated by attitude towards mobile banking adoption. A total of 250 bank customers from the Lagos area were selected and a structured questionnaire was designed and copies distributed to them. Data was analysed using multiple regression and computed using SPSS 20.0 computer application. Results show that Perceived Usefulness, Perceived Ease-of-Use, perceived Risk, Facilitating Conditions, Age, Educational Qualifications and Income significantly determine Mobile Banking Adoption. However, the relationship between gender and Mobile Banking Adoption is not significant. The outcome of this study has some implications to m-banking policy formulation and implementation. It also throws more light into what should be done to improve m-banking adoption rate in Nigeria. A O Faniran, James Adetunji Odumeru. "Acceptance of Mobile Banking in Nigeria: A Modified TAM Approach." 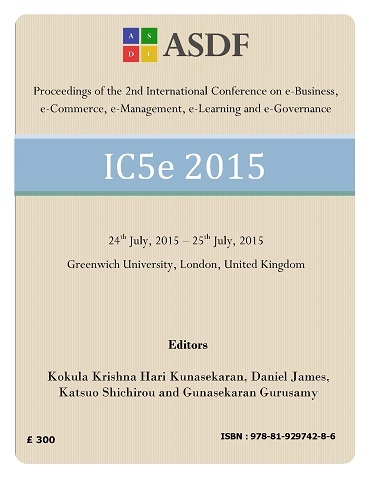 International Conference on eBusiness, eCommerce, eManagement, eLearning and eGovernance (2015): 39-49. Print.